President Donald Trump arrives aboard Air Force One at Palm Beach International Airport in West Palm Beach, Fla., March 3, 2017. President Donald Trump has accused his predecessor, Barack Obama, of wiretapping his offices at Trump Tower in New York City before the November 2016 presidential election. In a series of tweets Saturday, Trump likened the alleged wiretaps to the Watergate political scandal that eventually led to the resignation of former president Richard Nixon in 1974. Trump did not offer proof of any wiretaps. Obama's office has not responded to the accusations. In a tweet, former National Security Agency analyst and counter-intelligence officer John Schindler suggested the president's accusations may pertain to the Foreign Intelligence Surveillance Act of 1978 (FISA), which permits the legal surveillance and collection of information between foreign countries and their agents. The highest ranking Democrat on the Senate Foreign Relations Committee, Ben Cardin, said if the Obama administration did surveil activities at Trump Tower, it would have needed authorization from the FISA court. Republican Senator Lindsey Graham, a member of the Senate Judiciary Committee, said Saturday if the campaign was wiretapped at Trump Tower, "It would be the biggest political scandal since Watergate." "I’m very worried," Graham added at a town hall in Clemson, South Carolina. "I’m very worried that our president is suggesting that the former president has done something illegally. I would be very worried if, in fact, the Obama administration was able to obtain a warrant, lawfully, about Trump campaign activity with foreign governments. So it’s my job, as a United States senator, to get to the bottom of this." It was disclosed earlier this week that Russian Ambassador Sergei Kislyak met at Trump Tower in New York in December with Trump's son-in-law, Jared Kushner, and with since-ousted national security adviser Michael Flynn. Flynn was fired after just 24 days on the job when information emerged that he had lied to top officials about the nature of his conversations with Kislyak. FILE - Russia's ambassador to the U.S. Sergey Kislyak, speaks with reporters in Washington. 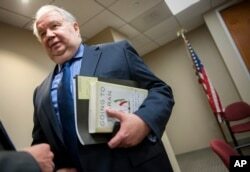 Contacts with Kislyak are at the center of the latest controversy surrunding the Trump administration. Revelations of the Trump Tower meetings surfaced after Attorney General Jeff Sessions admitted earlier in the week he met twice with Kislyak during last year's presidential campaign and failed to disclose those talks during his Senate confirmation hearing. Sessions has since said he would stay out of any federal investigation of alleged Russian meddling into the 2016 presidential election. White House spokeswoman Hope Hicks said Thursday the meetings at Trump Tower were intended to "establish a line of communication" between the incoming administration and the Russian ambassador. She added that Kushner also met with representatives of as many as two dozen other countries. U.S. government officials meet with representatives of foreign governments on many occasions and for many reasons, but the Trump administration had denied for months there was any contact between Russian officials and the new president's campaign. On Friday, the Breitbart News website published a report about conservative radio host Mark Levin's allegation that Obama conducted what he called a "silent coup" of the president by employing "police state" tactics. The article alleged the Obama administration took steps in its waning days to "undermine Donald Trump's presidential campaign and, later, his new administration. Trump's White House strategic advisor Stephen Bannon was once the executive chairman of Breitbart before being appointed to his current position. The claims come as the Trump administration faces mounting pressure from multiple FBI and congressional investigations into contacts between members of his campaign team and Russian officials. Senator Cardin, who received classified information from the outgoing Obama administration about Russia's interference in last year's presidential elections, has called for an independent investigation into meetings Attorney General Jeff Sessions had with the Russian ambassador. VOA's White House Bureau Chief Steve Herman contributed to this report.